So, I may or may not have turned 40 within the last month. If you’re only as old as you feel, I’m still 16 and probably ought not be trusted with much beyond car keys. Buying beer or raising children ought to be clean out.. If you’re as old as people give you responsibilities for, I’m probably in my mid 50’s. Or, if chronology represents age; well, let’s just say I’ll still lie and tell people I’m 29. Old enough to be trusted; not old enough to be wise. Anyway, weather’s turning up here in New England. Saw a golden tree, and the shadows are definately longer on my commute. Sun’s waiting until 6A to come up, and it’s down by the time the kids are in bed. The weather’s still tossing between summer and fall – some days, we’re gettting hot and wet blown up from the tropics; other days, there’s cool and dry blown down from Canada (Thanks!). But the pedals keep turning, and the feet ought to start striking pavement again on a regular basis following the New Haven Road Race. Friday afternoon, I was supposed to spend the day riding Jamestown, RI. But, work intervened, and I didn’t get started until about 2 hours after I was supposed to (Stupid me, working first instead of riding first). 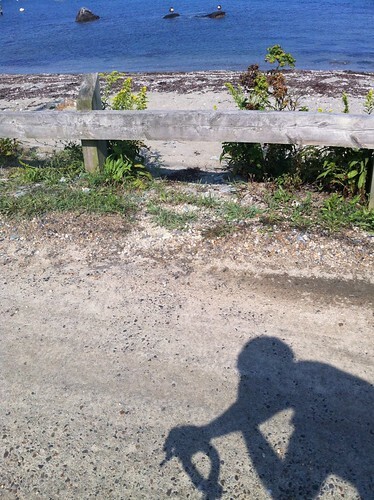 Finally got out, and headed north on the island – great tailwind headed north. Kept taking turns I hadn’t taken once I’d rounded the head of the island; passed lots of cyclists out enjoying the beautiful day. Then, while coming down Carr Lane, I hit a bump, and – dreaded pinch flat. No worries – fixing a flat’s a 2 minute evolution. ‘Cept – The tube was a short valve tube, and just barely stuck above my Easton EA50 rims, and I hadn’t put a new CO2 cartridge after my last flat. There was enough gas to get the new tube up to about 60 lbs, which could pretty safely get me back to the car at Ft. Weatherill. Coming back up to the car, I was tempted to continue down to Beavertail, ’cause the day was that nice. IN the end, I opted out – the rear end was squishy enough that one hard hit would have pinched this tube clean through, and I would have been hiking back to the car. And, I’ve been making a concerted effort to be home on time much more often, so didn’t want to risk irking the wife. Soaked in the cove for a while to make up for it. Longer shadows are all right. Sounds like peak outdoor exercise activity time is approaching. One of these days I’ll have to take a bike with me to Newport and stop in Jamestown for a ride. Sounds cool fun. Hey Bill, how is it that I can’t find a ‘add friend’ button on your Facebook page? Nice blog. I used to ride somewhat seriously 3-4 years ago, but don’t have anyone local that likes to share in the pain. I look at my bicycle every time I go into the garage and it’s yearning to be ridden again.